Wednesday, November 2, 2005. The hum of mountain bike tires on wet pavement lulled me into gray daydreams — flickers of my cold concrete office, the puzzle pieces of newspaper design, an interview with an artist — set against a backdrop of a steep hillside dotted with log cabins and Tyvek-coated shacks. My commute. Behind me, Kachemak Bay was shrouded in clouds, but still sparkling beneath a far-reaching finger of pink sunshine. I turned off West Hill and continued churning up the gravel of Diamond Ridge. It was only 4:30 p.m. and already daylight was fading. I rose above snow line and watched my front tire carve treaded tracks through a dusting of powder, which became deeper as I climbed. I had never ridden a bicycle through snow before. I was struck by the sudden silence; the snow muffled my tires and resisted my pedal strokes, until the entire world seemed to dissolve in a slow-motion dream. I exhaled. My frozen breath swirled in front of my face like silk curtains. I turned onto my side street and sliced through the powder, past the moose tracks, past the horse whose long hair was speckled in snowflakes, toward my own large single-room cabin in the woods, high on the bluff above Homer, Alaska. I had lived there just over seven weeks, and was still completely awed by my surroundings: the sparkling bay, the snow-capped Kenai Mountains, the ash-belching volcanoes, the quirky downtown buildings and cobbled-together cabins. I pulled my bike up the porch and looked out over my backyard. The view was absolutely jaw-dropping — rolling hillsides of spruce trees and alder blanketed in snow, all framed by the white mountains. I went inside and fished through several drawers until I found my camera, a cheap 2.1-megapixel Fuji digital that I acquired when I decided to move to Alaska. After all, you really shouldn't move to Alaska without a camera. I had only taken a handful of pictures so far — mostly of the amusingly vintage furniture we purchased at local garage sales to fill the spacious single room and loft, of my cat stalking voles in the tall fireweed, and the crumbling outhouse in the front yard. But the wintry scene demanded photography, even low-tech amateur photography. I snapped one or two shots and went inside to warm my numb fingers and toes. Later that night, I sat down to send a few e-mails to my family and friends. I muddled for words to describe everything that was happening — new job, new partnership, new life in a place that in nearly every way was worlds away from the life I knew before. “Today I rode my bike in the snow,” I typed in the subject line, and fired off my picture to the people I loved and missed. “You mean Bike to Shine?” he asked, referring to the blog I kept to document our Alaska road trip and cross-country bicycle tour in 2003. The next day, I typed up my introductory post and announced my new blog’s existence to all of my family and friends. “I’m going to update it in lieu of the mass e-mails I’ve been sending,” I wrote. “Expect lots more pretty pictures of Alaska, which I hope will convince you all to come visit me in Homer.” I didn’t know if anyone would read it. I didn’t know that a scattering of early comments from strangers would ease me into Alaska’s widely dispersed winter cycling community. 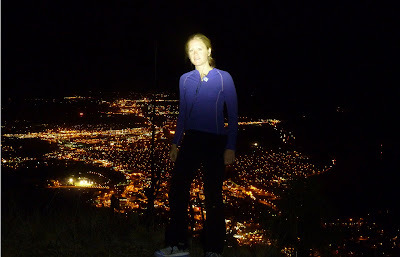 I didn’t know I would discover a race called the Sustina 100 and decide to use my blog as a training log. I didn’t know that readers’ financial support and encouragement would boost me through the completion of my first race ever — ultra or otherwise. I didn’t know that readership would continue to grow as I documented my ongoing discoveries in Alaska. I didn’t know that support would stay when I made the difficult decision to move to Juneau. I didn’t know my interest in photography would expand from nearly nonexistent to a daily habit. I didn’t know that I would continue to turn to the blog as a cathartic and creative outlet. I couldn’t anticipate the way my relationships with friends and family would enrich and grow in the way they did, because I had never before found such an effective way to communicate what was going on with me. I had no concept of the way tracking my training in a public forum would propel me to get out even when training was the last thing I wanted to do. 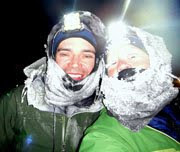 I couldn’t foresee the way this self-fulfilling cycle would propel me to success in undertakings such as the 350-mile Iditarod race and the 2,700-mile Tour Divide — endeavors that on November 2, 2005, would have seemed wholly ridiculous and impossible to me. I didn’t know this public forum would introduce me to an array of new people, several of whom became some of my closest friends. I didn’t know I would generate 1,276 posts over five years, an extensive record of a half decade of my life. I didn’t know the blog would see the dissolution of everything that sparked it — living in a quirky cabin in Homer, my training logs, my partnership, and even my life in Alaska — and still continue to develop and grow. I didn’t know that ~2,000 people would click into it daily, drawing a small but substantial pool of like-minded people from all around the world. I didn’t know that this blog would change my life. But I’m grateful for every facet of it. Happy fifth anniversary, Arctic Glass, and thanks to everyone who’s joined me for any part of the journey. am a newcomer to your blog, look forward to the next five years! Congratulations! I have been following your blog since you left Alaska. This is my first post. I look forward to the next five years! I follow your blog closely. Your adventures, writing and photographs are inspiring. I've been reading your words, and looking at your pictures, since you were in Homer. It's been great fun to watch the evolution! Happy 5th!! I enjoy your writing style and the photos that accompany your posts. Happy 5th! Congrats, Jill! Here's to another 5 years! HAPPY ANNIVERSARY ! From a loyal fan, avid reader but a non-commenter. Wow- Happy Anniversary! Thanks for sharing your incredible experiences. Happy Bloggiversary!!! It's been fun to read the last 5 years! Thank you for sharing the great stories and photos! I'm not sure how I found you, but was hooked by your photos of Alaska (my home-away-from-home, and place of birth) - I have stuck around for great views of Montana, and most of all for your writing. Congratulations on your blog-anniversary from a non-sporty couch potato who gets her exercise by walking the dog here in Switzerland. Thanks for blogging! I started reading your blog after your move to Montana. Excellent writing! Excellent journey! I'm a Swiss Biker (and another Beat), who read your blog since the beginning. You encouraged me to start my own blog (in german) in decembre 2005. Since 2006 you're linked in my blorole. I never wrote a comment because of my limited english skills. But today, I really like to thank you for all your posts and pictures, that I really appreciate. Your blog melped me a lot to better understand and improve my english. On the other hand, I always loved the beauty and the fantastic pictures of your surrounding. And, as a common base, I like cycling, especially mountainbiking. I wish you all the best and hope, you'll keep going long. All the best and kind regards. Congratulations on five years in the blogosphere. That's very long in the tooth for a blog and you can be very proud that, not only have you blogged for a long time, but you've done it very well. Your writing is fantastic and makes me envious. Keep it up, as there are many of us who would miss reading what you have to say. Congratulations on 5 years! My husband and I discovered your blog not long ago, and are looking forward to more great posts from you! I wanted to let you know that you've inspired me to try snowshoing. I've been obsessively trying to pick up a set for me and the hubby on ebay over the last 24 hours. I'm still trying to figure out where to find enough snow in West Michigan to use them. There's no awesome Montana mountain glory here...but I'll find a way! Your pictures and writing style are the best. Congrats on the "Wooden" anniversary. Happy 5th Blog-day!! I look forward to yet another year of following your blog! I never thought a Blog would land a 'new friend' on my doorstep...and since it has...well, you know the rest! Love to you, and happy Blogaversary! Happy Bloggerversary (spelling??) sister! I still remember when you told us you were moving to Alaska. I had just graduated from high school and was starting my first semester at college. Geez... now I have graduated from college...where does the time go?? Can't wait to read about the next 5 years of your life. Five years - congratulations Jill! The quality of your writing, the subjects that you cover and the minutia that you filter, your pictures and your consistency has kept your blog as one of the few sites that I religiously visit several times every week - for three years now. What you share with us readers is very inspiring and provides a good perspective for our own adventures and commutes. Too bad about the misinterpreted lyric; "Arctic Blast" would have been a great title for your adventures. Congrats on 5! Someday I will move this whole site to my jilloutside.com domain, when I finally get around to that total redesign I've been planning. I feel lucky to be a part of the 2000 or so daily followers. Happy anniversary! What amazing achievements during that time. Best wishes as you continue to pedal, run, click, write and enjoy life to the max! Jill, I was there when you first started your blog - Happy Anniversary - and I am still here now. I check your blog every day to see what new adventures you have undertaken. I am so glad to see that Montana is treating you nicely and that you have a new relationship going on. It was great following your blog and all your adventures. I will never forget the Iditarod - that is how I met your Mom and her and I were back and forth on the computer for days wondering what was going on. I look forward to following your life for a long time to come. Take care and keep up the great writing and photographing. Hsppy anniversary Jill ! I must thank the Fat Cyclist for putting me on to your blog a few years ago. I have always loved your brilliant and honest writing, following your great adventures and also the fantastic photography. Keep up the good work ! Great Blog, just stumbled into it, you lead an adventurous life! I hope you don't mind, but a I put a link on my own blog, but I just doing boring road riding and triathlon training in Denver! www.coloradobikeaholics.com. Cheers! Congratulations Jill and don't ever stop!! Greetings from Uruguay, South America! Wow, how fast five years has passed! I found your blog through a link on Fat Cyclist back in the beginning of his blog, and read all the archives up to that point, so I can honestly state I've read every post. Your innate talent for writing, and your photos of beautiful surroundings keep me coming back, but what I've enjoyed most is what I can only refer to as "watching you grow up". I'm old enough to be your mother, but have felt so much of the emotions you describe that it's like someone putting my life in words for me. You can articulate what I could only feel, is what I'm trying to say, I guess. Anyway, congrats on sticking with it and I look forward to more excellent posts and pics. Congratulations! Discovered your blog about a year ago before we moved up to Alaska. Look forward to following your future adventures. Jill, congratulations on five years of personal growth and expanding communicating skills! I have followed you since sometime in early 2006 and love your writing and your photos and your mind! 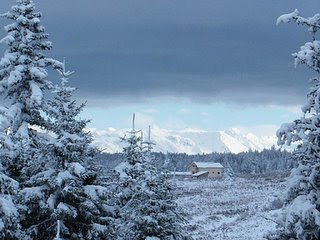 As another Alaskan winter descends, you are a wonderful light that shines on the horizon! Thank you for all the effort and dedication you bring to this.